October 20, 1976 is a high point in the history of Morecambe council. That's when they voted Dinah May (later my assistant) Miss Great Britain of 1976. You ask, "What's this to do with restaurants?" Real experts know that on that same date, having received permission from Westminster council, Peter Langan and Michael Caine opened a historic British restaurant called Langan's Brasserie in Mayfair. The restaurant remains one of London's most famous names. Though strangely, perhaps, it is one to which I never rushed. I've no objection to it. I've eaten perfectly good food there, including roast free range chicken, thyme and parsley stuffing, bacon and bread sauce and a spinach souffle. I've also had quite adventurous times. I took my friend OJ Simpson and his wife Nicole after we'd been to see Cats. You may have heard they since parted in somewhat unusual circumstances. I dined with Charlie Bronson and his wife Jill Ireland on our one day off filming. Peter Langan sat at our table within seconds, then slurped, spat, burped and dribbled over us for three hours. Charlie was far too polite to tell him off. Later, Peter Langan performed his usual function, which was to wobble drunk down the aisle, fall on the floor and go to sleep. It was a colourful feature of Langan's that you had to step over this recumbent man in a white suit. Peter was a great eccentric but, above all, he was a superb restaurateur. He opened Langan's Bistro on Devonshire Street and adjacent to it, Odin's. Peter himself always told me with pride that Odin's served far and away the best food in the group. I'm drawn to these recollections because Dinah and the ever-splendid Geraldine go frequently from the London Clinic a few yards away to Langan's Bistro, managed by a chap called Rocky, to get my lunch. "Rocky immediately gives us a glass of champagne," explained Dinah. It's not surprising the girls favour this ahead of other local hostelries. What I like about Langan's Bistro is the food is plain and simple. I recently had a chicken and liver salad with crispy bacon. The liver was round and tender, without a streak in sight. The bacon and salad were exemplary. This was followed by Langan's mixed vegetable pie, which looked like a vegetable pie should. Two pieces of crust on top of a tasty choice of vegetables all of which had individual flavours. I finished with a bread and butter pudding with custard. It was not in slices but was extremely pleasant nevertheless. Later I had red onion and stilton tart which was so good I left not a crumb, followed by smoked haddock with poached egg and hollandaise sauce which, even though it had taken the five-minute walk from the restaurant, was still fresh, moist and near perfection. I finished with Mrs Langan's chocolate pudding. Dark chocolate on the outside, white chocolate on the inside and a chocolate sauce. I've had massively less good desserts served at twice the price in famous restaurants. I think Langan's Bistro clever to restrict the size of the menu. Therefore what they offer, they can actually do. At the top of the menu is a watercolour by Patrick Proctor of Peter Langan, looking out in a kind of glazed way. It is massively to Michael Caine's credit that he nurtured Peter and brought him to the West End and ran the show for so many years. I still don't go to Langan's Brasserie much. I haven't been since I went with Michael Caine on August 13, 1995. Although I did try Langan's Coq d'Or on Old Brompton Road when it opened in 1998, after Richard Shepherd had taken over. More noteworthy than there, I feel, is Shepherd's restaurant in Westminster - a rare gem. 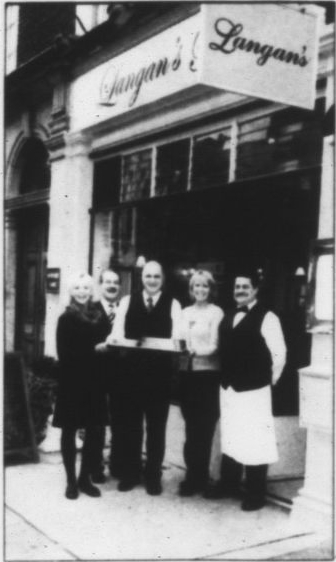 My fondest memory of Langan's Brasserie occurred when I wasn't even there. My dear friend Marlon Brando was staying close by at the Mayfair hotel. Marlon hated the press and hated being noticed. "I wandered into this restaurant called Langan's last night, Michael," he told me, "just down from the hotel. The place was full of paparazzi who endlessly photographed me. It was full of people who wanted to be around me. I fled." I could have advised Marlon to stay and see the incredible display of 1970s art which fills the main restaurant walls of Langan's Brasserie, or the evocative first-floor Venetian murals by Patrick Proctor. I well understood Marlon's disenchantment with being photographed. This is a reason you don't see me grinning at you this week. Another could be that it would require 10 people to transport my bed and place it in front of the group! How lucky to be offered a meal by Lady Rogers! Due to enter the Wellington hospital for an operation, I tanked up on lunch the day before at the wonderful River Cafe - however this did not prevent me from losing over 5lb during the following week due to the almost inedible food at the hospital. Perhaps there should be a Michelin Guide to hospital catering. So you've been unable to find goat curry on a London menu. Clearly your choice of orthopaedic convalescent facilities is to blame. Had you had the good sense to be admitted to Guy's, not only would I have had the pleasure of sticking needles into your corpulent figure, but you would have been served an NHS goat curry about once a week. We find it speeds discharge no end. How touching that while MW was deprived of his liberty and confined to a small room with only two visitors he should get such a nice letter from his friend Tone, and how providential that he will be able to return the favour when his chum could soon be in a similar situation. I send my sympathy and best wishes to . . . the London Clinic!